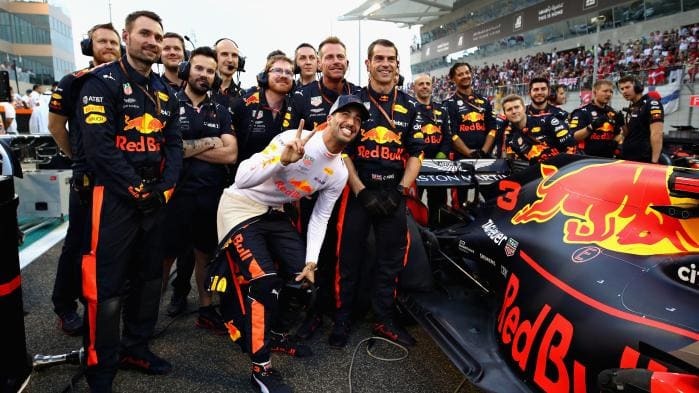 Daniel Ricciardo produced a typical Daniel Ricciardo response as his colleagues and teammates heaped praise on him following his final Red Bull race at the Abu Dhabi Grand Prix. The Aussie, who will drive for Renault next season, wanted a final podium – possibly even a final celebratory shoey – for the team he has enjoyed so much success with for the last five years but was ultimately left “helpless” as he came up just short to finish fourth. As a frustrated Ricciardo crossed the finish line for the final time in a Red Bull, he was greeted with a warm message from his engineer Simon Rennie following the conclusion of their time together – only to respond as only he could.